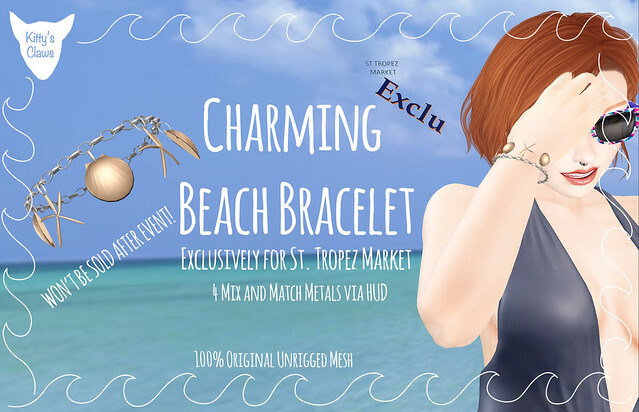 I would like to inform you that I will be in the St. Tropez Market event coming up tomorrow on the 17th running until August 27th. I have two new sets coming out, with a gift that will only be available at the event. The gift will no longer be sold anywhere so you have to make the trip to the event to grab it! The Stars Below the Sea Set is a small starfish necklace and earring set. All the items are resizeable via touch. This retails for L$150. The Shell Out Set is a shell necklace and earring set. All the items are resizeable via touch. This retails for L$150. The gift is my Charming Beach Bracelet with metal charms and a metal chain. Both the charms and the chain have four mix and match metals via an HUD. It is also resizeable via touch. This will NOT be resold after the event. Once again here is a TAXI to the event! Next: Next post: Kitty’s Claws: Beauty Marks!